Maubert Mutualité metro station offering access to line 10 is 190 metres from this hotel. The hotel has a 24-hour front desk and can assist in making restaurant reservations. Hotel Moderne Saint-Germain located in the latin Quarter and Saint-Germain des Prés, the heart of the city, is close to all these places reminding of Paris prestigious history : Notre-Dame, Cluny Abbey, the banks river Seine and the second hand book sellers, Saint-Michel, Saint-Germain, Beaubourg, the Louvre and Orsay Museum. In this lovely place, full of charm and character, you will appreciate the art of good living, making your stay a moment to remember. Fitness is for free. The hotel is located in the Latin area, 3 minute's walk from Notre Dame, the Seine River and the famous Boulevard St Germain. The nearest metro station is Maubert Mutualité (Line 10), a 2 minute walk away. Metro stop St-Michel Notre-Dame is about 7 minutes' walk away. The continental buffet breakfast is served from 07:00 to 10:30 every day. The hotel Modern St Germain will be under refurbishment from 4 or 5 January to mid-March 2009 (hotel lobby reception, breakfast rooms and lounge). 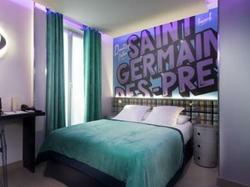 Breakfast will be served at the nearby Hotel Sully St Germain. For more information, please contact the hotel directly. The rooms will also be fitted with new windows, but this will not cause any inconveniences for hotel guests.